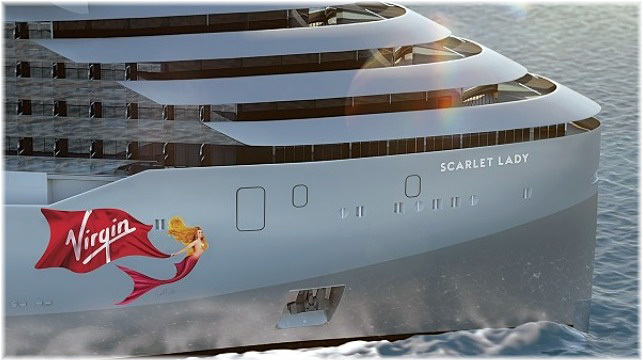 Last week saw the floating out at Genoa of Virgin Voyages’ first ship, and the announcement of Scarlet Lady as her name. The name was used before by one of Virgin Atlantic’s original 747 jumbo jets, an aircraft that has only recently been retired after a long career with Virgin. Also last week it was announced that Norwegian Cruise Line would move its Norwegian Joy, a “Breakaway Plus” class vessel initially tasked for the China market, to work with sister ship Norwegian Bliss between Seattle and Alaska. Meanwhile, in news from New York, Lindblad Expeditions has announced an order for a second newbuilding polar expedition ship to join the National Geographic Endurance. Boom In Expedition Ship Orders – Other Cruise News: A’Rosa Plans New River Ships – Swan Hellenic: Minerva Or Another? Over the past year there has been a boom in expedition ship orders, with sixteen vessels now on order and options placed for at least five more. Of these, half a dozen will be Polar Class 6, built for summer/autumn operation in medium first-year ice, which may include old ice inclusions, in Arctic and Antarctic waters. Elsewhere, Rostock-based A’Rosa Cruises may be about to order additional river cruisers, while Swan Hellenic is looking for a replacement ship for the Minerva. RMS St Helena makes an appearance in London on June 7, 2016, on her final UK voyage before being sold. This week the news is all about small ships. First, the 128-berth St Helena and Ascension supply ship RMS St Helena visited London during her last UK visit before leaving service. At the same time, however, because wind shear is preventing safe landings at the new St Helena airport, her contract has been extended for three more voyages from Cape Town. Next up, Lindblad have revealed preliminary itinerary details for their latest ship, the 100-berth Quest, which is due to enter service a year from now. And finally, the 224-berth Ocean Diamond has started her second season for Iceland Pro Cruises out of Reykjavik. The fabled Northwest Passage took three years to cross when Raould Amundsen first traversed it from east to west in his Gjoa in 1903-06 and Henry Larsen of the RCMP made it the other way in the St Roch in 1940-42. A century later, however, large passenger ships such as the 43,524-ton residence ship The World and the 68,870-ton cruise ship Crystal Serenity are threatening to turn it into a tourist playground. Last week came news that yet another cruise ship, Regent Seven Seas Cruises’ 28,550-ton Seven Seas Navigator, would join the Crystal Serenity in making the passage in 2017. While Crystal sail from Seward to New York, Regent will be sailing from Seward to Montreal. Artist’s impression of MSC Seaside, which will resemble Miami Beach in more ways than one. MSC Cruises has been trying to bust the US market for more than a decade now but has not yet been able to do it in a meaningful way. But two-and-a-half years from now, it will introduce its best ship, the 4,140-berth MSC Seaside, first of a brand-new design, into service from a modernized dedicated pier in Miami. Elsewhere, sidewheel paddle steamers now cruise only two of the world’s rivers, the Nile and the Murray, but that number is about to double when the 96-berth Loire Princesse is added to the Loire next month and the Elbe Princesse to the Elbe next spring.